Over the past three weeks, six critically endangered North Atlantic right whales have died in Canadian waters. With only about 500 of these massive plankton feeders still alive, these deaths represent a loss of more than 1 percent of the entire population for the most endangered large whale species in the Atlantic Ocean in less than twenty days. This unprecedented loss over such a short period of time has alarmed right whale scientists, including those at the Anderson Cabot Center for Ocean Life at the New England Aquarium and the Woods Hole Oceanographic Institution (WHOI), who have worked for decades to help this species recover and have grown very concerned about recent declines in the population. Mark Baumgartner, an associate scientist at WHOI and Chair of the North Atlantic Right Whale Consortium, stated, “This is a right whale mortality disaster. The loss of so many animals so quickly has probably not occurred since right whales were hunted in the early 1800’s.” Last autumn, researchers officially recognized that the right whale population has declined in recent years, caused by reduced birth rates, the highest rate of human-caused deaths ever recorded, and changes in right whale feeding areas. Changes in the oceanographic characteristics of their traditional feeding waters in the Gulf of Maine have led to changes in right whale movements. 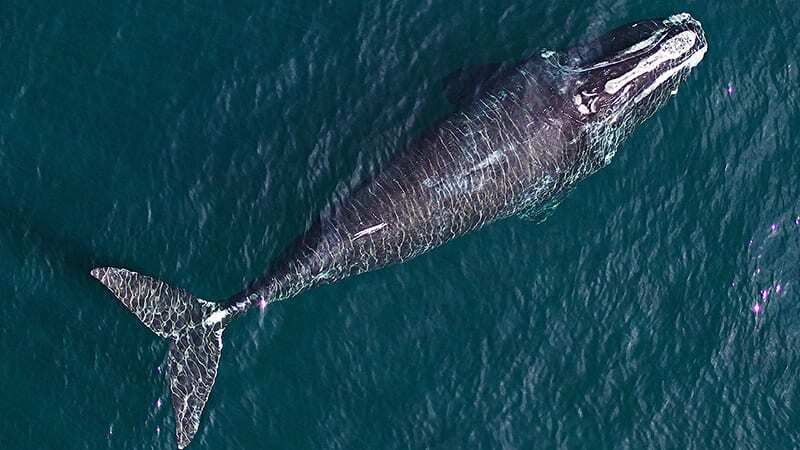 The right whales’ broader search for copepods, their preferred rice-sized zooplankton, has prompted a search by whale scientists to find other possible feeding areas further north in Canada’s Maritime Provinces. Moira Brown, a senior scientist with the Canadian Whale Institute and the Aquarium’s Anderson Cabot Center, noted “In recent years, we have had increasing reports of right whale sightings in the southern Gulf of St. Lawrence and have shifted more of our field surveys there to determine how important these waters are to right whales.” All six whale carcasses were first sighted in waters north of Prince Edward Island and southeast of Quebec’s Gaspe Peninsula. Aerial survey flights over the past week have spotted dozens of other live right whales still in the region. One of the dead right whales was found entangled in snow crab gear, but the cause of death of the other five whales is unknown. “Over the past thirty years, the two leading causes of death for right whales have been vessel strikes and entanglement in fixed fishing gear,” said Amy Knowlton, an Anderson Cabot Center researcher who has worked at reducing human-caused deaths of right whales. Five of the whale carcasses still at sea have yet to show evidence of entanglement or trauma from a collision with a boat or ship. In other large whale die-offs, humpback whale deaths in the northwest Atlantic were tied to naturally occurring bio-toxins associated with red tide algae. However, Anderson Cabot Center scientists who manage the right whale photographic catalog point out that there has never been a right whale mortality attributed to bio-toxin poisoning in the nearly forty years of their study. The next suspect for such a cluster of unexpected mortalities might be disease. Four of the six right whales have been individually identified through photo comparison by Anderson Cabot Center staff, and Knowlton noted, “None of the identified whales looked in compromised health at their last sighting, some as recently as just a couple of months ago.” The first dead whale spotted on June 6 was a ten year old, young adult male who was last seen in Cape Cod Bay on April 23 by the Center for Coastal Studies. The elapsed time between those sightings was only about six weeks. The other identified dead whales included two adult males, at least 17 and 37 years old, and a highly valuable 11-year old young adult female. Through DNA analysis, two of the males were known to have sired calves. The two remaining unidentified whales were a male and a female. Researchers stress that the plight of right whales warrants urgent action, and that partnerships among industry, scientists, conservationists and government regulators as well as government and private funders are essential to developing new approaches to saving the species.